AFTER more than two decades focusing on greater Brisbane and interstate markets, Citimark Properties is preparing to take a $1 billion plunge on the Gold Coast over the next five years. 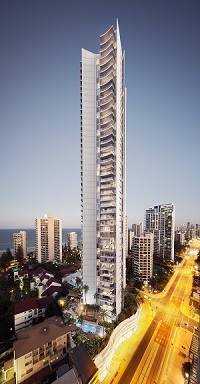 The cashed-up Brisbane-based company, which has developed more than 1500 apartments and 1000 land lots since 1990, has launched its first high rise apartment project in Surfers Paradise worth $160 million. It has also laid plans for a major mixed-use project on Chevron Island worth $80 million. Citimark joint managing director Angus Johnson says the company is also undertaking due diligence on a number of other projects, including traditional land subdivisions and townhouse projects, with a view to boosting its Gold Coast portfolio to about $1 billion. The planned investment in the Gold Coast over the next five years represents more than half of Citimark's $1.8 billion project workbook in south-east Queensland, and comes as both Johnson and his brother-in-law and business partner Robert Pullar have waited patiently for the tourism strip's property market to stir back to life. Citimark, which takes a cyclical approach with its business, had 36 projects under way in Queensland, Victoria, northern NSW and Japan at the end of 2006. "We started selling our development book in 2007 and 2008, and by the end of 2008 we sold $600 million worth of property," says Johnson. "We've had some success in the past looking at the cycles and we've been looking at the Gold Coast market for the past couple of years. "We've gradually seen an oversupply of apartments going to undersupply, along with infrastructure projects like the light rail completed, the growth of the health and education industry and a softening Australian dollar and the effect this has had on tourism. "We're conservative and risk averse, and when we look at the fundamentals of the Gold Coast market we think the planets are aligning." Both Johnson and Pullar, who both live in Brisbane but own homes on the Gold Coast, have invested in city's property market since 1983 but have never undertaken large-scale developments on the Coast. Armed with a strong balance sheet following the 2006 portfolio sell-off, Johnson says Citimark has positioned itself among the early movers in the current cycle. Early this year, the company paid $11 million for a 2020sqm redevelopment site at the corner of Markwell Avenue and Surfers Paradise Boulevard, just south of the Q1. The company has laid plans for a 45-level tower with 206 apartments on the site. Johnson says marketing for the $160 million development, which has yet to be named, will begin in a couple of months. Citimark is also in the planning stages for an $80 million residential and retail development on Chevron Island, in what is destined to become the island suburb's largest development project. Johnson says while it's too early to predict how long the current upward trend will last, he sees greater stability for the Gold Coast in the years ahead. "The fundamentals for the Gold Coast have never changed; it's in the fastest growing region in Australia and it was always going to recover," he says. "The Gold Coast market also has greater depth today than in 2007-08. It's a stronger economy. "The market in general probably underestimated the positive impact of the completion of the light rail and the construction of Commonwealth Games infrastructure. "The recovery is well and truly under way. We've seen the cycles over an extended period of time and the peak of each cycle has always surpassed the previous cycle. "We're certainly very confident in the future of the Gold Coast. How long it has to run I'm not sure, but I think the growth of the health and education industries and improvement in transport infrastructure and the fact the Gold Coast of today is closer to Brisbane in travel time than 10 years ago, the cycles will flatten out." Citimark's previous residential projects include the $155 million Central Brunswick urban renewal project in Fortitude Valley, the $130 million Evolution riverfront tower in Brisbane's CBD, the $95 million Felix tower, a 25ha Mitsubishi Motors industrial redevelopment in Adelaide and the 330-lot Emmadale Gardens estate at Gladstone.